Eat in or take out. A quick snack, a full meal, or just dessert. Whatever you're hungry for, we've got you covered at Roc-Star! Open from late April through September, Roc-Star offers a full menu of delicious food including appetizers such as mozzarella sticks or onion rings, beef and pork barbecue, chicken tenders, juicy fried chicken, and hearty burgers such as our Big Andy double bacon cheeseburger topped with crisp lettuce, fresh tomato and onion. Or how about a Philly steak sandwich served on a fresh baked roll? 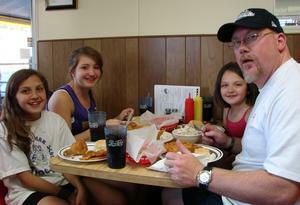 Every Friday, Roc-Star features a fish fry that includes a free sundae for dessert! Eat inside our air conditioned rock star themed dining room, enjoy our outside dining area, or take your order to go. Coaches, treat your team to some ice cream or goodies after the game. Teams receive a 10% discount!